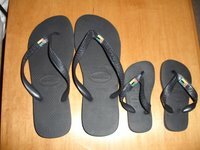 The only thing cuter than the baby flip flops is Zeca's fat little feet in them. 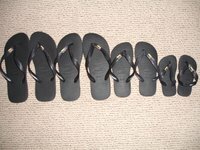 "Flip flops for a child less than 2?" you ask. Yes...she has always wanted a pair of her own. The moment Luisa pulled them out of the suitcase, Zeca dropped the toy she was playing with and exclaimed in delight, "Zeca's shoes!" I need a Foot Loaf photo. me too! family flops. i think flip flops represent a philosophy of life... in an everything's- gonna- be-all-right kind of way. i will worry, however, if you all head out to a jimmy buffett show this summer.